We're kicking off Odyssey Performance Art Festival with a parade. Led by Pyewacket Kazyanenko the event will start off on top of Sugar Mountain on Odyssey and parade down, through and around the sim. All avatars are encouraged to bring friends & robots, think carnival, animal, wacky, invisible or what ever you want. During the event all are encouraged to rezz outrageous things, vehicles, oddly shaped prims, fruit and funny hats, to set off explosives, particles and sounds. Celebrate being an avatar and march together whether you be friends, enemies or unlikely lovers. The parade will end at a small stage where all avatars are invited to perform. Be Big! Make Noise! The Odyssey Avatar Parade! On July 5, 1934 police killed two longshoremen at a massive dockworker strike in San Francisco, a tragedy known as Thursday, Bloody THURSDAY. SaveMe Oh gives the word cinema a new dimension with the reprise of her ScreenMe performance. Originally made for SaveMe's return in Caerleon but rejected at the last moment, ScreenMe has been performed only once before, in May 2011, on the Amsterdam sim. The Avatar Orchestra Metaverse is a global collaboration of composers, artists and musicians that approaches the virtual reality platform Second Life as an instrument itself. The Orchestra conceives, designs and builds its own virtual instruments, making it possible for each individual performer in the Orchestra to trigger sounds independent from one another and to play together in real time. These instruments feature sound, visuals, and animations. 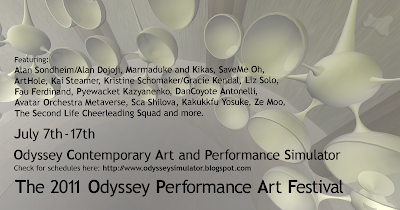 AOM will perform a unique concert on Odyssey featuring the composition Xaana. Gracie Kendal, also known as Kristine Schomaker in real life, just completed her Thesis for the Masters Degree in Art with the execution of her "My Life as an Avatar" www.graciekendal.wordpress.com where she utilizes installation, text, photography, mixed media, video and performance to explore her real life through the lens of her second life avatar. "I am projecting myself onto another form and confronting my own imperfections," Kendal says. "My work deals with the process of becoming self-aware while living in a media-saturated, technologically advancing society." ArthOle has reformed for the 2011 Odyssey Performance Art Festival, and will host a remixed performance of ORIENTATION (last seen in 2009). ORIENTATION is a multimedia promenade performance that relies on audience participation. The attendees arrive at the location and will be guided by interactions from the actors. Due to the nature of the performance, numbers will be limited to ten people per date, on a first-come, first-served basis. Please reserve your place by contacting Arahan Claveau or Nebulosus Severine in-world. An interactive happening by Kakukkfu Yosuke. Using Yosuke's scripted prims become a shadow, play with fleshlights. Join avatars from communities from all over Second Life to come together for a festival of absurd creative competition and over-the-top artistic performance and entertainment. AWF wrestlers will be accompanied by members of the Second Life Cheerleading Squad. Started in 2007 by Christi Charron, the SLCS has blossomed into the largest and most successful Cheerleading groups within Second Life. Wednesday July 13 - Noon SLT - EXTRA PERFORMANCE! A hybrid reality performance – avatars and humans in real space terraform and beautify the front of the Eastern Edge Gallery in St. John's, Newfoundland. Thank you Fau, Liz and the Odyssey crew for putting together this year's festival. What a lively first day it was too! Just wanted to correct the SLT date on the Senses Places Participatory Performance. It is on Saturday 16th at 1 AM, not the 15th. Although it seems like Friday night it will be already Saturday.